Amid much fanfare, the Nairobi-Mombasa railway line opened in Kenya on May 31, 18 months ahead of the schedule. It represents the second major railway undertaken by China on the African continent recently, after the launch of Addis Ababa-Djibouti Railway in January. Chinese media outlets have spoken glowingly about these African infrastructural investments, often in the context of the One Belt, One Road Initiative that seeks to attain economic development through greater transport connectivity. African leaders seem to concur, as many are taking out massive concessional loans from China to fulfill ambitious projects, such as the East African Railway Master Plan, in the coming decades. But there is strong doubt as to whether African countries have the financial capabilities to put such ambitious plans in action. In the case of the Addis Ababa-Djibouti Railway, for instance, its total building cost of roughly $4 billion is almost a quarter of Ethiopia’s 2016 government budget of $12.57 billion. Even at concessional rates, servicing and repaying the debt will be a significant burden for the government in the coming years and decades. It is unfathomable how the government will be able to undertake other infrastructural projects even if the economy, and the government budget, grow at a steady clip, as it has done in recent years. Indeed, beyond the headline projects such as cross-country railways, infrastructural spending can weigh even higher as a proportion of the local African economies. Anecdotally, I have spent the past two years residing in the rural Iringa region in Tanzania, where Chinese firms have been building various government office buildings and brand-new tarmac roads linking its various townships with major cities across the country. While precise numbers are unavailable, given the region’s dependence on the commercial production of maize, lumber, and tea as the economic mainstay, it is conceivable that such constructions can amount to large portions of the local government revenue, in many cases unsustainably so. The concept of “in-kind payments” smacks of colonialism in some ways. The historical precedent of European colonists comes to mind. Europeans built infrastructure in Africa at the turn of the century, purportedly also for local economic development, but in essence the projects were used for natural resource extraction. 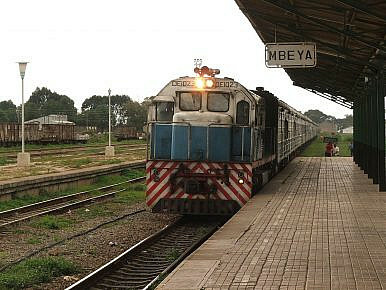 The predecessor of both the Nairobi-Mombasa and Addis Ababa-Djibouti railways can be categorized as such. Both connect inland regions with mineral deposits with major ports on the Indian Ocean. And there is no doubt that some of the same natural resources sought out by European colonists a century or more ago are also desired by the Chinese. While building infrastructure, the Chinese have also invested massively in local mines and processing facilities. At least part of the cargo to be shipped by the new railways and roads constructed with Chinese financing is expected to be natural resources to feed the Chinese industrial machine. Yet the active participation of Chinese construction firms in the Belt and Road initiatives across the world cannot mask the fact that the Chinese economy is steadily shifting away from dependence on the natural resource-heavy manufacturing sector. The tertiary sector of the Chinese economy already comprises of more than half of the entire economy, and is expected to continue growing in proportion of the total economy at the expense of both primary and secondary sectors. And as factor inputs in China become relatively more expensive, low-end, natural resource-intensive manufacturing is expected to continue shifting to more price-competitive neighboring states such as Vietnam. In other words, if infrastructural developments in Africa associated with the One Belt, One Road project will primarily benefit China by faster and cheaper transportation of African natural resources to the Chinese economy, such benefits, especially when compared to the costs of potentially non-repaid loans, may be much less than anything that European colonists obtained from their ventures in the past. Viewed in this light, there can be some doubts as to the financial viability of providing loans to African states for building infrastructure. However, the public may be underestimating the potential political leverage that the Chinese government gains by holding billions of dollars in sovereign debt across the world. By ensuring that these debts are paid in some form or the other, whether it is economic concessions, political agreements, or a combination of both, China may in the long term formulate a new kind of diplomatic relationships with these foreign countries. This is particularly true in much of the sub-Saharan African region. Given the local economies’ low levels of industrialization, weak economic governance, dependence on commodity exports, and unsophisticated financial systems, if the Chinese, through individual and state-level actors, are to seek controlling stakes in these countries’ financial, real estate, and resource management sectors, China may receive amplified benefits from any future economic developments in these countries, much more than can be calculated just in terms of debt repayment. If almost monopolistic control of Southeast Asian economies by the ethnic Chinese serves as any reference, dominance of the local economic infrastructure through control of banks, real estate, trade networks, and retail space is pivotal for ensuring wealth remains concentrated within Chinese families despite wave after wave of anti-Chinese regulations, protests, and violence. China’s leveraging of sovereign debt stemming from infrastructural investments may greatly accelerate this process and deepen the economic control to one less politically toxic than the Southeast Asian case. Either way, it is still a little too early to say that African infrastructure projects are money-losing ventures. Yes, impoverished countries where investments will be received will not be able to repay loans in cash even decades down the line. But to equate success with financial returns is shortsighted. The Chinese government and its arsenal of state-owned firms certainly do not think in this manner. Historical experiences have equipped them with the expertise to leverage economic positions for political gains that will prove much more important than money in the long term. Xiaochen Su currently resides in Iringa, Tanzania, working for a NGO that helps smallholder farmers to increase productivity through provision of high-quality agricultural inputs and microcredit. Su previously studied International Political Economy at the London School of Economics.